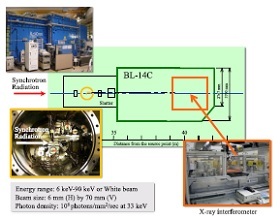 BL-14 at the Photon Factory, Japan is a characteristic synchrotron radiation beamline where one can use a vertically polarized synchrotron radiation beam from a superconducting vertical wiggler with a field strength of 5 Tesla. One of the experimental stations, BL-14C, is dedicated to x-ray imaging such as x-ray phase-contrast CT using a large x-ray interferometer, x-ray diffraction enhanced imaging (DEI), DEI-CT and x-ray dark field imaging (DFI). The phase-contrast CT using an x-ray interferometer is sufficiently sensitive to evaluate small density differences in soft tissues and soft materials. Recent results on medical and industrial applications of phase-contrast CT using the large x-ray interferometer are reported by five papers in this special issue. Kyoto Collection of Human Embryo and Fetus is a valuable collection for human developmental research during pregnancy. Although serial sections contain huge morphological information, specimens are sliced and destroyed. Three-dimensional imaging in non-destructive way are developed and now applied to the human specimens. Now, morphological changes of embryo and fetus are analyzed by geometric morphometrics as well as conservative morphometric technique using obtained images. Phase-contrast X-ray imaging technique has theoretically about 1000 times higher sensitivity than conventional absorption X-ray technique. The properties and biomedical applications of various phase-contrast X-ray imaging techniques such as refraction, crystal interferometer, DEI and Talbot interferometer, are introduced shortly. 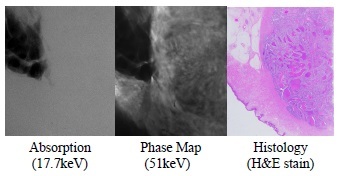 Then uising most sensitive crystal-based X-ray imaging system, we showed the images such as formalin-fixed brain tumor nearly resembling to pathological pictures, sequential changes of the implanted colon cancer by anti-cancer drug in live animal, and human breast cancer. Phase-contrast X-ray computed tomography (CT) is a unique technique for the observation of phase changes of compounds due to its high sensitivity to density. Owing to the difficulty in controlling the temperatures of samples without disrupting the measurement of the X-ray phase-shift, the application of the X-ray CT, except under room temperature conditions, has been limited. We have developed a temperature-controlled system for the X-ray CT measurements. In this report, nondestructive three-dimensional (3D) observations under different temperature conditions using phase-contrast X-ray CT techniques are presented. These techniques allow the visualization of temperature-controlled crystals composed of water molecules and their growth in complex materials. Gas hydrate pellets contains large amount of gas about 160–170 times as much as its volume and it is stored at 253 K by self-preservation effect. The self-preservation effect is exhibited by ice film on the gas hydrate surface. 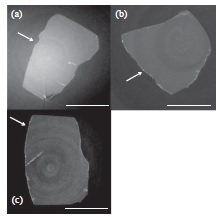 Phase contrast X-ray imaging is effective tool to distinguish ice from gas hydrate. 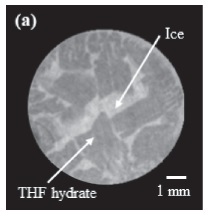 It revealed that self-preserved gas hydrate pellets had ice film on its surface without internal dissociation by phase contrast X-ray imaging. On the other hand, gas hydrate pellets including NaCl were dissociated from its inside, then gas volume that they hold decreased. Phase-contrast X-ray imaging using X-ray interferometer (X-ray interferometry) has the highest sensitivity among several phase-sensitive methods, and is a powerful tool for non-destructive three-dimensional observations. In this article, industrial applications such as real time operando observation of lithium ion battery and thermal three-dimensional observation of heated water (X-ray thermography) were reported.